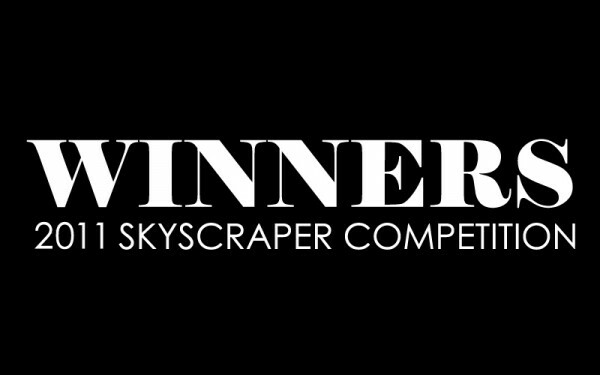 eVolo Magazine is pleased to announce the winners of the 2011 Skyscraper Competition. Established in 2006, the annual Skyscraper Competition recognizes outstanding ideas that redefine skyscraper design through the use of new technologies, materials, programs, aesthetics, and spatial organizations, along with studies on globalization, flexibility, adaptability, and the digital revolution. This is also an investigation on the public and private space and the role of the individual and the collective in the creation of a dynamic and adaptive vertical community. The award seeks to discover young talent, whose ideas will change the way we understand architecture and its relationship with the natural and built environments. The Jury of the 2011 edition was formed by leaders of the architecture and design fields including: Juan Azulay [principal Matter Management, professor at Southern California Institute of Architecture], CarloMaria Ciampoli [port director Live Architecture Network], Mario Cipresso [principal Studio Shift, professor at University of Southern California], Ted Givens [principal 10 Design], Eric Goldemberg [principal Monad Studio, professor at Florida International University], Jose Gonzalez [principal Softlab, professor at Pratt Institute], John Hill [editor Archidose], Mitchell Joachim [principal Terreform One, professor at New York University], Andrew Liang [principal Studio 0.10., professor at University of Southern California], Javier Quintana [principal Taller Basico de Arquitectura, Dean of IE School of Architecture], Rezza Rahdian [Architect, Second Place 2009 Skyscraper Competition], Michel Rojkind [principal Rojkind Arquitectos], and Michael Szivos [principal Softlab, professor at Pratt Institute]. The Jury selected 3 winners and 32 honorable mentions. eVolo Magazine received 715 projects from all five continents and 95 different countries. The first place was awarded to Atelier CMJN (Julien Combes, Gaël Brulé) from France for their ‘LO2P Recycling Skyscraper’ in New Delhi, India. The project is designed as a large-scale wind turbine that filters polluted air with a series of particle collector membranes, elevated greenhouses, and mineralization baths. The second place was awarded to Yoann Mescam, Paul-Eric Schirr-Bonnans, and Xavier Schirr-Bonnans from France for a dome-like horizontal skyscraper that harvests solar energy, collects rainwater, and preserves the existing urban fabric at ground level thanks to its large skylights and small footprint. The recipient of the third place is Yheu-Shen Chua from the United Kingdom for a project that re-imagines the Hoover Dam in the U.S. as an inhabitable skyscraper that unifies the power plant with a gallery, aquarium, and viewing platform that engages the falling water directly. Among the honorable mentions there are “waterscrapers” that clean oil spills and desalinate sea water, inverted skyscrapers for a floating Olympic villa, recycling towers, research skyscrapers that harvest lightning power, vertical cemeteries and amusement parks, sports skyscrapers, fish farms, and “living mountains” for desert climates. Other proposals use the latest building technologies and parametric design to configure environmentally conscious self-sufficient buildings. eVolo Magazine would like to acknowledge all the competitors for their effort, vision, and passion for architectural innovation and the members of the Jury for their knowledge, time, and enthusiasm during the long review process. eVolo Magazine is also pleased to announce the publication of a Limited Edition book (only 500 copies) that celebrates the sixth anniversary of the prestigious international Skyscraper Competition. With more than 3,000 projects received, we are showcasing the best 300 proposals from the past six years, including 2011, in a large-format hardcover book. Our goal is to edit a true gem of contemporary architecture printed in over one-thousand full-color pages.